Mimaki Goes for the Glow at ITMA 2015 in Milan. 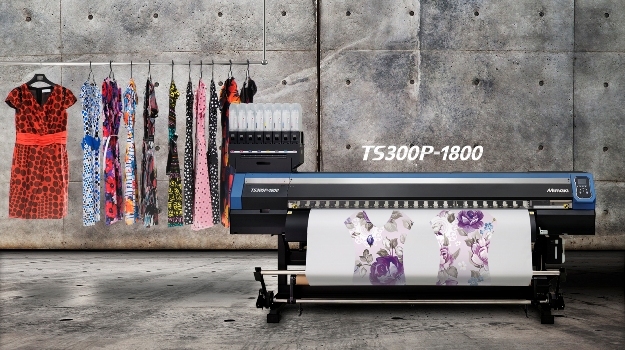 Mimaki has just announced the availability of two new fluorescent inks for its TS300P-1800 inkjet textile printers. It will be demonstrating these new inks at ITMA in Milan, the world’s most established textile and garment machinery exhibition. One of the key elements of the event is that it brings together industry leaders and provides the opportunity to discuss and evaluate emerging trends and innovative solutions. Mimaki’s new neon fluorescent inks, available in Yellow and Pink, are being promoted as being ideal for fashion, sportswear, swimwear and shoes and are specially developed for use in the low-volume, high-quality sublimation paper transfer market. Mimaki pointed out that whether cycling, running, badminton or football, every team needs to have its own shirt, usually with a name, number and the sponsor’s logo clearly visible. Producing these relatively small, customised lots cost-effectively requires sublimation technologies, and printing the entire garment rather than applying graphics information afterwards is more profitable. With traditional print, the desired neon colours are hard to achieve and small lot production is generally not cost-effective. Full details on Mimaki’s expansive product portfolio can be found at www.hybridservices.co.uk or by calling 0044 (0) 1270 501900. A dedicated blog on this topic can be found at: www.mimakieurope.com/blogs/printing-for-sports.